The 2015 line-up has just been announced, and the 33rd annual Winfest is shaping up to be the most memorable to date with Black Oak Arkansas taking the spotlight as the festivals main event! If you're gnawing at the bit to find out more about the players taking the stage in 2015, follow the hyperlinks by clicking on the bands name below or check in on the TALENT page where we will be showcasing each artist in the COUNTDOWN TO WINFEST in the following weeks leading up to the festival! The 2014 Winfest reveal trailer is here! see you September 20, 2014! Winfest is right around the corner, and in preparation we're holding a new artist spotlight every week up to the day of the Festival! Subscribe to our facebook page or keep checking back here every Wednesday for a short bio on a select artist from this years line-up ! Larry Brick and Rachel Fields-Brick --both Arkansas natives-- come together with their natural approach of Ozark Gospel Blues in Brick Fields. Larry, on guitar and background vocals along with Rachel using her ambrosial voice while playing guitar and flute, bring together a stormy performance each and every time. Catch them LIVE for their first time appearing on the Winfest MusicFestival line-up September 20th, 2014 to see what they're all about! Slowtowne Serenaders﻿ have been a part of Winfest﻿ MusicFestival in one part or another since the dawn of time and we're happy to announce that they will be on the bill yet once again this year! Wherever the Slowtowne Serenaders are, a fun-loving crowd is sure to follow, and I assure you that you'll be having as much fun in the crowd as they are up on stage! Their music is a mix of blues and rock with tons of original material as well as an extensive list of cover tunes. Check out their grooovy southern tunes available on reverbnation, FREE for your listening pleasure! Stay tuned to the feed as we hold a new artist showcase every week in our count down to Winfest! Click here to sample their sweet hometown sound! The WinFest committee has been hard at work for several months now to insure that the festivities and accommodations at this years event are nothing short of spectacular. This years talent line-up is solid! You can find more information about performers for the 2012 Winfest Music Festival by clicking on the talent tab or clicking here. Those interested in getting in on the horseshoe tournament will pay the usual entry fee of $20.00 a team. $10.00 a person. Tee shirts are in production! This years tee is an absolutely amazing design and we're eager to share it with you, but we also like to build up anticipation, so you'll have to wait just a while longer to see it. It will be well worth it, I assure you! They will sell for $25.00 at the event. Vendors are being booked. If you're interested in setting up a booth contact Brook Lockhart by clicking on her name or find her e-mail address and phone number on our vending tab above. This page will be ever-changing leading up to the festival. Be sure to stop back by for updates, and new information. We'll be here to keep you posted on all things WinFest! ﻿The OFFICIAL 2014 WinFest line-up. Winfest is less than 4 days away and we couldn't possibly be more excited! If you're new to the groove click here to find out more about our annual event. You're certainly not going to want to miss it! This is going to be one to remember folks! Gates open at 10am at the Winslow ball feild in Winslow Arkansas! Directions can be found in the "Attend" tab in the upper right corner of the page or by clicking here! WINFEST 2013 PROMO OUT NOW! 31st annual Winfest will be held on Saturday September 14, 2013 at Winslow Ball field in Winslow Arkansas. The date for the 31st Annual Winfest Music festival has been set in stone! Mark your calendars! Winfest will be held on September 14th, 2013! Are you pumped? Lot's of really exciting announcements (including the coveted stage line-up) will be taking place in the next few weeks leading up to the festival. Like our page on facebook to find out how YOU could win tickets and/or official Winfest merchandising! The marvelous hooper girl that took headlines all throughout the internet and made people all around the globe say, "What the heck is Winfest?" is up for nomination as woman of the year on BREAK.com! She certainly has our vote! what are you waiting for? Act NOW! VOTE TODAY! WinFest 2012 is a Wrap! Fist and fore mostly, we'd like to thank ,YOU, the fans. Without you Winfest would cease to be. We hope to see all of you coming out and bringing your family for another 60. Terry Reed, Gale Barker, Darin and Elaine Wood, Debbie Tillman, Justin Branson, Tammie Smith, Kelly Scovile & Mom. We'd also like to thank all of our sponsors. If you have the time, please stop by their pages and thank thank them as well. These companies donate a lot of money and products toward making our festival great! Airways Freight, JJ's Grill and Bar, Walmart Fayetteville - W Martin Luther King Blvd, Sam's Club Fayetteville,AR,Premium Brands of Northwest Arkansas, McBride Distributing Company Inc, Super Foods in West Fork, Pack's Storage, and Time Stripping. We'd also like to thank Adam and Brad of Forge Productions for providing lights and sound. We hope that they can make it out for the 31st! You gave us the beat and filled our souls. For the 31st Annual WinFest Music Festival! Did I forget to mention that WE'VE GONE VIRAL? Check out Katie Sunshine in the link below! 2012 Winfest Music Festival preparations are in FULL swing! The WinFest committee has been hard at work for several months now to insure that the festivities and accommodations at this years event are nothing short of spectacular. This years talent line-up is solid. You can find more information about performers for the 2012 Winfest Music Festival by clicking on the talent tab or clicking here. As always, WinFest will still go on. Rain or shine, Noon to 10:00pm. Tickets will be available for $10 at the gate. Children 12 and under will enter FOR FREE. Tee shirts are in production! This years tee is an absolutely amazing design and we're eager to share it with you. But like to build up anticipation so you'll have to wait just a while longer to see it. It will be well worth it. I assure you. They will sell for $25.00 at the event. The men in charge of the 29th Annual WinFest DVD have been wonderful enough to make the 30th annual teaser as well. You can see it by clicking on the link here or scroll down just a little further to watch it here on the Winfest page. DVD pre orders are still available. Be sure to order now. Stock at the festival will be limited. You can find a link to pre order here or by clicking on the 'Merch' tab above. 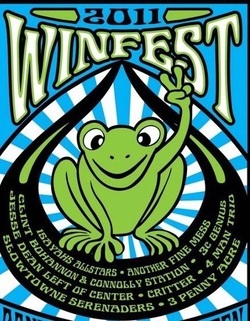 The 30th Annual Winfest Music Festival Will be taking place on September 22nd, 2012 (9.22.12)! Remember to check back with us often for further details including ticket information and the line-up. The excitement is building as most of the preparations are coming to a close and everyone's getting ready for the 29th Annual WinFest Music Festival-- TOMORROW-- Saturday, September 17th, 11:00am at the Winslow ball feild in Winslow Arkansas! Directions can be found in the "Attend" tab in the upper right corner of the page. It's been a long time coming. Are you as excited as we are? Remember: Tickets, T-shirts and DVD pre-orders will be at the gate. Tickets and DVD pre-orders are aso available HERE online via the "merch" tab. All Merchandising supplies are limited and are at a first-come, first-serve basis. So you'll want to get there early to make sure you don't miss out on anything! As always, kids 12 and under get in FREE! We look forward to seeing each and everyone of you there! News will continue to be updated on this page for the 30th anniversary of WinFest, happening next year, and predictions are that it is going to be the biggest and best yet! No bands have been confirmed as of this time, but talks have already begun at the WinFest committee meetings about what they would like to see. What would YOU like to see? Remember there's a questions and comments box below the news feed at the very bottom of this page. As always, the WinFest OFFICIAL page is here via weebly.com and will always be your one-stop place for any and all things WinFest in the years to come. We hope you drop by frequently for more exciting news and details on upcoming events. If you have liked our page on facebook, announcements on news updates will be posted to the status feed linking you right back here in the event you may need to have your memory jogged. We hope that everyone has a safe and responsible weekend! Enjoy the show! We covered a lot of bases at this weeks committee meeting. Band performance times are now locked in and will be posted within the next week, details about the annual horseshoe tournament have been set (more on that in a minute), the film crew covering the documentary DVD sat down and discussed stage preparations, shirt orders are in and more vendors are being booked--these are just a few of the items on today's docket and plenty more details will continue to be combed through within the next two weeks in order to set the stage for the main event: The 29th annual WinFest Music Festival! Help us spread the word! Select the "going" tab on our Eventful countdown bar and share it with your friends! Time for sign up: 11:00am to 12:30:pm on September 17th, the day of the festival. The tournament itself starts at 1:00pm and ends when it ends. Winners split the pot with the WinFest committee who are donating their portions to community Meals on Wheels and other various non-profit organizations. More information from the producers of the Winfest DVD suggests a change in the incentive to pre-order the documentary. Shouldacouldawoulda Studios has announced that fans who pre-order the commemorative DVD will receive a double sided Special Edition of the film rather than the previously announce History of WinFest booklet. Side "A" being the documentary itself, and side "B" being extended footage from the show including more live music, extended backstage accounts, and other special features only available with the pre-order offer. $5 Pre-orders* can be made in the Merchandising tab at the top right of the screen or in person at their booth at the event on September 17th. The producers, however, are strongly recommending that pre-orders be made prior to the event if possible so they can get a round-about idea of production costs. *WInFest Documentary DVD MSRP $20.00. $15.00 after pre-order. Tickets may also be purchased on this page, online, by selecting either the "attend" or "merchandising" tabs in the top right of your browser. While there, be sure to check out the design for the 2011 WinFest Music Festival Houndstooth Press T's and beverage koozies as well as all of our other great memorabilia which will be available on the day of the event. Shirts and koozies will be in limited supply. We're ordering 200 of the 2011 designs as well as 50 of 2010's. Get there early. Go home happy. As always, this page will be ever-changing throughout the coming weeks. Be sure to stop back by for updates, and new information. We'll be here to keep you posted on all things WinFest! Be sure to go to the "attend" or "merchandising" sections to get your tickets, pre-order your WinFest Music Festival DVD, and check out the 2011 T-shirt and koozie designs! You can also check out the commercial for the 2011 WinFest Music Festival directly below. The next WinFest committee meeting is tomorrow (08/31/2011) so if you have any questions,comments, or anything you'd like to know about be sure to get that to us in the comments box at the bottom of the page before 6:00pm tomorrow evening. We look forward to seeing you there! This page will be ever-changing throughout the coming weeks. Be sure to stop back by for updates, and new information. We'll be here to keep you posted on all things WinFest! We are excited to announce that WinFest ticket orders and 2011 WinFest Music Festival LIVE DVD pre-orders can now be made online through PayPal®! Ticket orders can be made on the "Attend" page and DVD pre-orders can be made via the "Merchandising" tab under the "more" option in the top right corner of the browser. Thanks for all of your patience! Hope to see ALL of YOU there! "But wait! Where's that 'surprise' you promised?" I've been so busy getting all of the updates to the page today that I haven't been able to get to it yet. But don't worry! If it's not on here by midnight tonight it will most certainly up by tomorrow afternoon. As a matter of fact, I'm going to get started working on that for you now. So, as always, Be sure to stop back by for updates, and new information. We'll be here to keep you posted on all things WinFest! That little "surprise" I was talking about will be up before the break of dawn. Also coming Friday will be an extra special treat for you WinFestivillians and Left of Center fans. "What could it possibly be?" you might ask. I don't suppose it would be that big of a surprise if I told you, now would it? I was able to scrape up a little bit more information about the tournament. Rumor has it that some sort of buy-in will be involved and the winners of the show-down (it's apparently a doubles game) split half. We've still 3 weeks left until the big day and loads more information will be pouring your way. As stated previously: this page will be ever-changing throughout the coming weeks. Be sure to stop back by for updates, and new information. We'll be here to keep you posted on all things WinFest! The WinFest committee has been hard at work for several months now to insure that the festivities and accommodations at this years event are nothing short of spectacular. This years talent line-up is solid and contains musical performances spanning nearly every genre. Houndstooth has once again designed a groovy-trend setting and comfortable shirt spirited in traditional WinFest fashion. Concessions and vending are being lined up providing everything from smoked turkey legs to Sno-cones. Coming new to the event is a documentary style DVD commemorating next years 30th anniversary of the WinFest Music Festival. Pre-orders will be taking place online and at the gate. Those who pre-order will receive the History of WinFest commemorative booklet (that will be sold at next years event) absolutely free as a token of our appreciation. This page will be ever-changing throughout the coming weeks. Be sure to stop back by for updates, and new information. We'll be here to keep you posted on all things WinFest!